Ever Wonder How the Northern Lights Are Created? Seeing the Northern Lights has been one of the major things on my bucket lists for some time now. The amazing and mystical lights of green, pink, and purple that light up the sky seemed so magical and I wanted to make sure I saw them at some point in my life. So, when we moved to Iceland, I knew that seeing the Northern Lights would finally be checked off the ‘ole list. 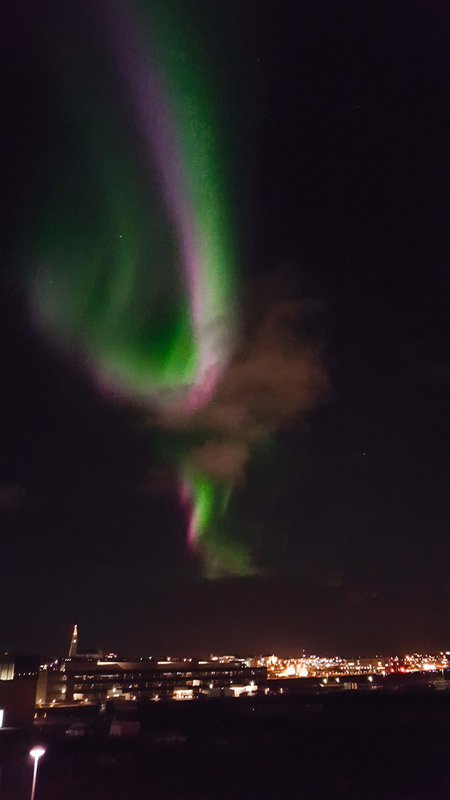 Fortunately, for us, we moved to an area that, while in town, was pretty much removed from direct lights that allowed us to keep watch from our living room window then go out to our balcony when we saw a giant beam shoot across the sky. There were several nights in the fall where we saw some amazing shows, all from the comfort of our home. But, it hit me after seeing them a couple times and becoming obsessed with monitoring the Aurora forecast, “what exactly are the Northern Lights?” I had no idea how they were created, what had to line up in order to make these beautiful displays that looked like they came from another galaxy. So, I decided to do some research, and I’d like to share that will you all….in case you too are curious how Northern Lights are created. The Aurora Borealis begins when the sun emits charged particles in what’s called a solar flare. Solar winds then carry these particles throughout the solar system and towards the Earth. These particles then penetrate into the Earth’s magnetic shield and combine with the oxygen and nitrogen in the atmosphere. The collision of all these charged and gaseous particles with those in the Earth’s atmosphere form to create the stunning colors that make up the Northern Lights. There’s a distinction in color depending on which gas the solar flares come in contact with. If the collision occurs with oxygen, we’ll see a red and green aurora. If nitrogen is involved, we’ll instead see pink and purple colors. The Aurora runs on an 11 year cycle, known as the solar cycle. You can of course see them throughout the entire cycle, not just every 11 years, but the Lights will become brighter and more frequent or dimmer and more scarce the closer or farther away from the 11 year mark. The last cycle began in 2014, meaning that the next big spike in the Northern Lights is set to occur in 2025. So, you might set you calendars to plan a trip that year for some amazing Aurora viewing. As I’m sure you know, you have to be north in order to see the Northern Lights. 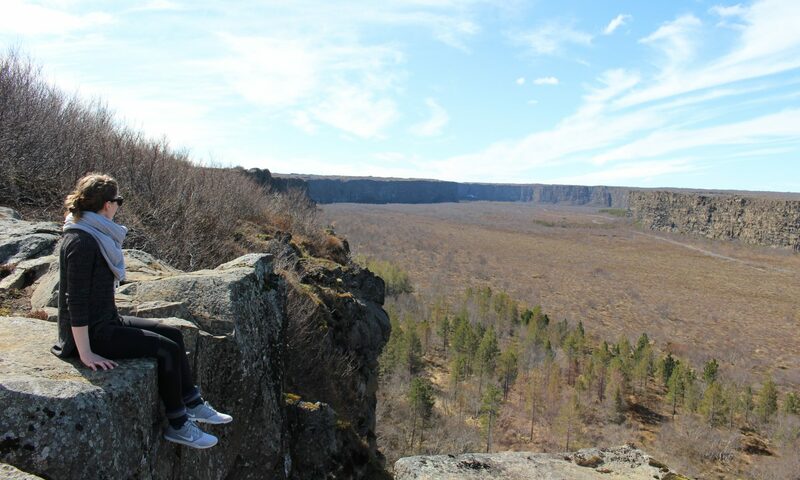 The best viewing spots are in the northern parts of North America (northern Canada and Alaska), Greenland, Iceland, Northern Norway, and Russia. 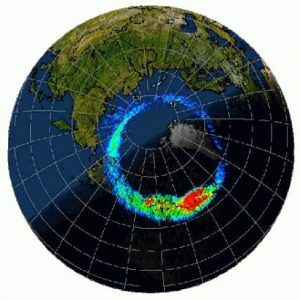 The Northern Lights form a circular band across these areas. So, if there’s Northern Lights are there also Southern Lights? Well, my friends, that was one of my questions, as well. There are indeed Lights in the south, called Aurora Australis, but they are concentrated over Antarctica and the surrounding ocean, so it’s not likely you’ll be seeing the Southern Lights. The interesting thing about the best viewing areas are their extreme changes in daylight. During winter months, there can only be about 4 hours of daylight each day and in some spots none at all. This creates intense darkness that makes it perfect for viewing the Aurora. The thing is, the Northern Lights are happening all year round throughout the day, but in the summer these areas don’t get much if any darkness, meaning that even though Northern Lights are occurring it never gets dark enough to see them. As an example, here in Reykjavik, our shortest day (December 21st) only gave about 4 hours of daylight. In contrast, the longest day (June 21st) only has a night of about 3 hours. This means that in the summer the sun never fully sets, and in the winter the sun never fully rises. It’s two polar opposites that either create scenarios for amazing Northern Lights viewing and ones that make it impossible to see them. One important thing to learn when watching out for the Lights is how the activity is measured. When you use websites, such as the ones I have listed below, they are going to display the activity using a measurement of Kp. These numbers range from 0 to 9. The higher the number, the more activity occurring. Now, you don’t need a 9 or even an 6, really, to see the lights. The higher the better your chances, but you could actually see some at even a 2. Some of the best displays we saw were only at a Kp of 2 or 3. The big thing to keep in mind is that you need both activity and clear skies. If the Kp is high but its a night of overcast skies you might not be able to see what’s going on above the wall of clouds. So, if you have a Kp of 2 and totally clear skies, you should definitely keep an eye out, even though the activity is low. Alternatively, if you have a magical night of a Kp of 8 with some clouds in the sky, it would still be worth keeping an eye out. The clouds might block some of the intensity, but since an 8 is so high you’ll likely see them through the clouds. This can be tricky in Iceland since cloudy skies are the norm, but try to keep these two factors in mind – Kp measurement and cloud coverage. The websites and app I list below will help you monitor both so you can maximize your chances of seeing the Lights. When to come: The best months for viewing the Aurora are in September, October, March, and April. You’ll have a good amount of darkness during these months and clearer skies than in the deeper winter months. Where to go: The easy answer here is to go where there are no lights. There are a few places around the city that allow for this. One of the popular places is around the Grótta Island Lighthouse, west of the city center. Due to needing to get away from the lights, it would be easier to have a car, but if you’re willing to walk a bit there are plenty of places you can get to on foot. You could also opt for a guided Northern Lights tour. There are several companies that will take you outside the city to really get away from the lights. Oftentimes, they will also let you go back out and try again if you don’t see any on the date you pick. We did one with Super Jeep that I can highly recommend. The guides were amazing and funny, and they serve you hot chocolate with Icelandic vodka to keep warm. There are also apps that you can either set your location to or let it use your phone’s location to notify you when the chances of seeing the Lights are optimal in your area. I often used My Aurora Forecast. It could be a little….optimistic in telling me that I could see the Lights, but it was a nice way to keep an eye out for them. I hope this was helpful in both learning more about what creates the amazing Northern Lights and in your hunt to find them. If you find yourself in Iceland, feel free to let me know; I’d be happy to give more recommendations and help you create the best opportunity for seeing the Lights.